The Nest 1.8m fluid head tripod with 75mm bowl is a great solution for durable support and smooth operation while shooting with your video footage on a DSLR camera. 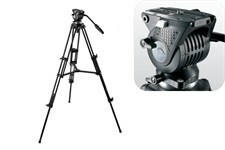 The Nest NT-777 fluid head tripod has a 360 degree pan range for uninterrupted shooting. The bowl mounted fluid head allows the tripod head to be set to level while shooting on an uneven surface. The ergonomic leg adjustments gives you a quick easy tripod height adjustment with strong locking. The 1.8m operating height makes for a useful operating height when you need to shoot over the top of a crowd. The mid-level spreader on this tripod provides extra stability, and the rubber feet prevent sliding on floorboards and smooth surfaces.